Alameda del Libertador Bernardo O'Higgins, a large boulevard in downtown Santiago. Santiago Province (Spanish: Provincia de Santiago) is one of the six provinces of the Santiago Metropolitan Region (RM) of central Chile. It encompasses the majority of the population of that region, including 31 of the 36 communities of Greater Santiago. The province spans 2,030.30 km (1,262 mi). 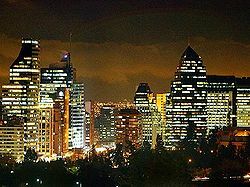 As a province, Santiago is a second-level administrative division of Chile. Unlike all other provinces of Chile, which are governed by a provincial governor appointed by the president, the duties of provincial governor are instead carried out by the intendant of the Santiago Metropolitan Region who is also appointed by the president. In January 2001, the Provincial Delegation of Santiago was created via a Provincial Delegate, who exercises the functions of a provincial governor on behalf of the intendant. The province comprises 32 communes (Spanish: comunas), each governed by a municipality consisting of an alcalde and municipal council. The climate of the Santiago Province, and generally of the Metropolitan Region is temperate Mediterranean cold, of the kind called continental. Precipitation is concentrated in the winter months, generally as snow over 1000 m above sea level and, in colder years, over the city of Santiago. Winter tends to be cold with frequent frosts during which temperature drops below 0 °C. The summer months are usually dry and hot. The Cordillera de la Costa acts as a climate screen and reduces marine influence, which makes the climate more continental. This situation becomes apparent when comparing precipitation from a coastal location such as Valparaíso (460 mm) with that of Santiago de Chile (360 mm). The annual median precipitation reaches 367 mm on average. The annual median temperature comes out to 13.5 °C, with a median high of 21 °C and a median low of 6 °C. Most of the province is made up of an extremely fertile, level prairie that the locals call la Depresión intermedia (Intermediate Depression). The terrain is known for its low elevation in relation to sea level and for being surrounded by hills, as well as emergent so-called island hills, such as Santa Lucía (an ancient extinct volcano), Blanco, and Renca, present today in the city of Santiago. There is some occurrence of the endangered Chilean Wine Palm, Jubaea chilensis within the Santiago Province; this iconic tree of central Chile had a much larger range prehistorically, before the decimation of much of its habitat by the expanding human population. Before the Iberian conquest, the central zone of Chile was sparsely inhabited by an indigenous population of Picunches, the northern branch of the Mapuches. The European occupation had a considerable impact on the native population and culture, which suffered a rapid and profound disintegration. Chief among the reasons was the Spanish Crown's granting of gifts of land to its colonists. In addition, the institution of a system of encomiendas, only abolished by the end of the 18th century, had irreversible consequences. It represented first the appropriation of indigenous ground, and second the practice of Spaniards receiving groups of natives who had to pay tribute. Over time, in the Province, as in the whole country, cultural identity became predominantly European in character, with minor hints of native character, thus setting in motion a process of homogenization of the population. According to the census of 2002, Santiago Province has 4,668,473 inhabitants, of whom 2,244,497 are male and 2,423,976 female, meaning that the number of males is 92.6% that of females. 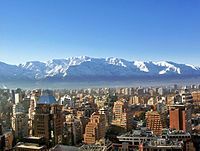 The population density is the highest in Chile, with 2,999.4 inhabitants/km2; the most densely populated comuna is that of Lo Prado and the most populous is La Florida, a suburb of the capital. In 2002, there were 4,658,687 persons living in urban areas and 9,786 persons living in rural areas, classifying 99.79% of the population as urban. The annual population growth rate is calculated for 2005 as 0.9%. Life expectancy is exactly the Chilean national average, which is the highest national life expectancy in Latin America: 80 years on average, 78 for men and 82 for women. The area has an average household income of $29,062 in PPP US dollars (2000). The population tends to be concentrated evenly between the heart of the city and the suburbs, due to government promotion of populating urban centers in high-rise buildings by offering state subsidies, thereby avoiding the progressive extension of Greater Santiago. Santiago Province's economic activity produces about 30% of the country's total income; a high number due to both having the capital of the country within its area and to its central location. The "primary" or agricultural sector represents less than 3.5% of the economic activity according to the census, a figure that has remained virtually unchanged during the first few years of the 21st century. The "secondary" or industrial sector contributes 21% of the region's GDP. Finally, the tertiary or service sector fluctuates around 76% of regional GDP. This province stands out for its industrial predominance, but most of all, for its service sector. Industry is widely diverse and along with Valparaíso and Biobío regions, it is one of the country's three industrial pillars. Machinery and electronic equipment, leather, food processing, chemical and metallurgical industry are Santiago Province's most important industries. The predominance of the service sector can be explained by the activity from the following industries, among others: electricity, gas, water, construction, commerce, transportation and communication, financial services, housing, education, health, and public administration. The basepoint for numbering the kilometers of the "Central Highway", the Chilean portion of the Panamerican Highway is in Santiago Province. This Kilometer Zero falls at the intersection with the Alameda del Libertador Bernardo O'Higgins. The highway, nicknamed "Norte-Sur" ("North-South"), consists of quality pavement and two- and three-lane roads. This route links Santiago with Valparaíso, Viña del Mar, and the summer resorts and beaches in the fifth region of Valparaíso. In addition, it connects the towns of Casablanca and Curacaví. The toll highway, consisting of two- and three-lane sections of well-maintained pavement, extends for 115 kilometers. The "Highway of the Sun" is a toll road that links Santiago with San Antonio, and from there connects to other coastal towns including Llolleo, Cartagena, El Quisco, and Algarrobo. It also connects to the more central Melipilla, Talagante, El Monte, Padre Hurtado and Peñaflor. Route 78 extends 110 kilometers. This 40 kilometer route joins Santiago with the winter resort towns of Farellones and Valle Nevado. This route connects Santiago and the province of Puente Alto with Cajón del Maipo. It extends roughly 70 km to its termination in the town of El Volcán. Other important highways in Santiago province are its network of Autopistas Urbanas (urban highways). Santiago's first toll roads began to operate near the end of 2004. The tolls for uctronic payment system called Televía or TAG. Vehicles must carry TAG devices to use the highways. The province's railroads are a vital form of daily mass transit. They are operated by the state agency EFE. It provides a continuous railroad between the cities of Valparaíso in Valparaíso and Puerto Montt in Los Lagos. The trains of Metrotrén connect the outlying suburbs with the capital. Another important mode of transportation in the city is the Santiago Metro, a subway system. The five train lines carry an average of one million people daily, making the metro one of the leading means of transportation in the entire country. In one year, the metro services over 360 million people. Both the metro and the railroad system are considered the most modern in Latin America. The Transantiago bus system is also important. This article draws heavily on the corresponding article in the Spanish-language Wikipedia, which was accessed in the version of 28 November 2005. Wikisource has the text of a 1921 Collier's Encyclopedia article about Santiago Province, Chile. This page was last edited on 7 April 2019, at 22:57 (UTC).